Jersey City Ballroom Can Make Your Event Better. 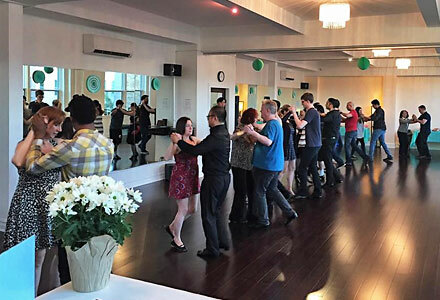 Jersey City Ballroom offers rental space to the community for dance rehearsals and special events. If you’re looking to host a reception, birthday party, baby shower or any other event, Jersey City Ballroom does it all. Our Studio is the Perfect Place to Host Your Next Event. Jersey City Ballroom is located in downtown Jersey City within the Brunswick Center. Our space has a grand feel and includes high ceilings with chic chandeliers, large windows with plenty of natural light, beautiful hardwood floors, and state of the art sound. Receptions, birthday parties and other special events are welcome in our space. Our ballroom is over 1600 square feet, however we also have a retractable divider that will create a community room on one side of the ballroom (Ballroom B, approximately 800 square feet). 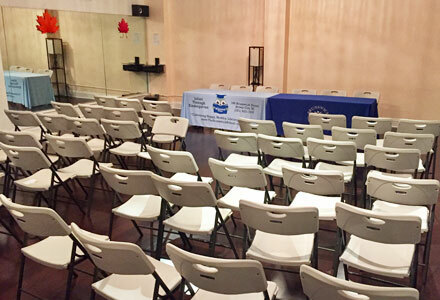 The community room can hold up to 30 people and is great for smaller events or dance rehearsals. The full ballroom can fit around 60 people. Take your special event to the next level in our elegant space. You can host baby showers, birthday parties, kid’s events, children’s parties and other celebrations. We have 2 options available, for special events up to 30 people, half the ballroom (Ballroom B) would lend a cozy atmosphere. For events up to 60 people, the full ballroom would provide a spacious feel. Host your next workshop or lecture in our community room. You can host up to 50 seated people with space for a head table. It’s a great place for a community forum, discussion or presentation. Past events have included debates, therapy groups and informational sessions. 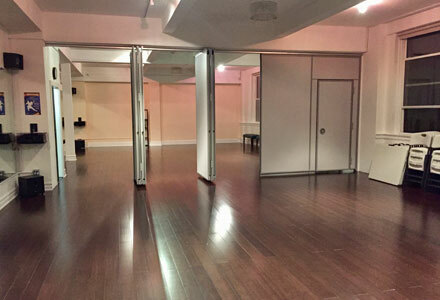 Cushioned hardwood floors, a wall of mirrors and an easy to use sound system make our space a great fit for your next dance practice! We currently host rehearsals for Bollywood, hip hop, modern and contemporary. 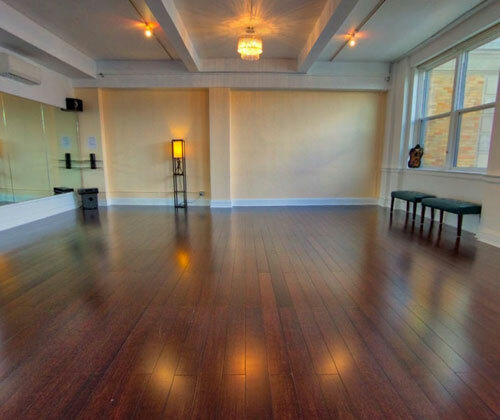 We also rent our space for stretching, yoga and Zumba classes. Looking for a fun activity with friends? We’ve got you covered! 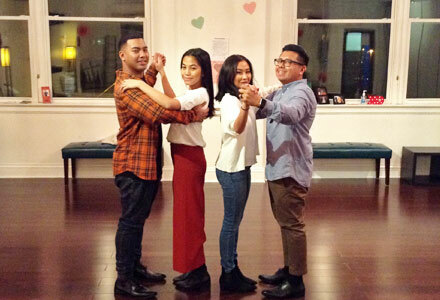 Gather some friends and learn some new dance moves, from ballroom, to swing or Latin, we’ll work with you to find the right fit. 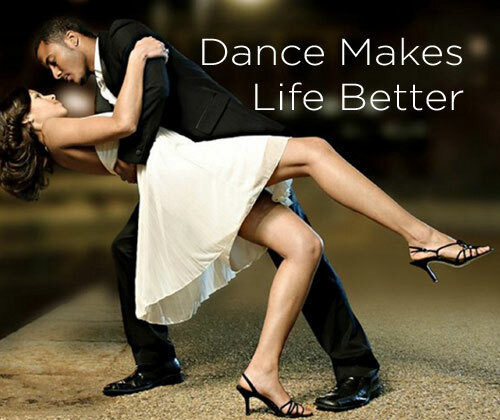 You can also use a private dance class to organize a wedding party dance, sweet 16 performance, cotillion dance class, quinceanera presentation and other group dance choreography. Rates start at $30 per person with a 4 person minimum. 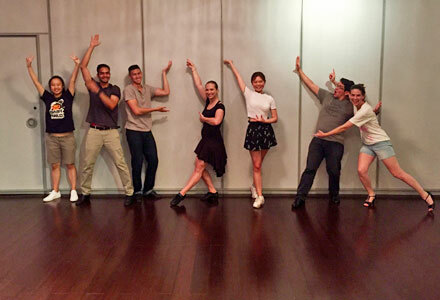 Special rates available for parties of 7 people or more and/or recurring private group classes. For questions or to schedule a lesson, contact our studio at 201-969-6260 or send us an email.